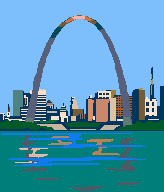 This guide will help you find reliable information on St. Louis and Missouri. Descriptions, maps, data, and links to neighborhood resources. Regional development association for North St. Louis County. Wikipedia's list, from the U.S. Census Bureau, with population and area. Includes St. Louis City and most of the 91 municipalities in St. Louis County. Links to St. Louis County Municipalities, by list and by map. From Municipal League of Metro St. Louis. Nonprofit community organization with a mission to revitalize the Old North neighborhood in the city of St. Louis. City of St. Charles official website. Map from STLtoday showing crime statistics for neighborhoods in the city of St. Louis as well as St. Louis County. Documentary film by Chris Jeske about the Feb. 7, 2008 shootings.